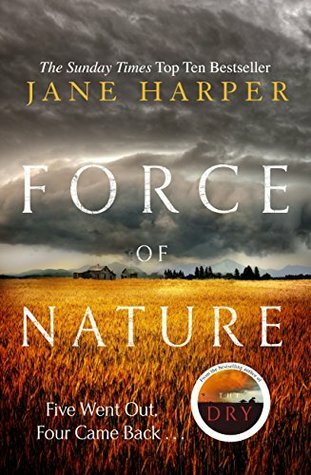 Read a full summary of Force of Nature by Jane Harper below. If you can’t remember what happened in Force of Nature and you need a refresher, then you’re in the right place. There’s a company holding an employee retreat (that really doesn’t sound like much fun) during which a group of men and a group of women have to travel through the outback separately. At the end of the few days, the women return several hours late, injured, and missing one person – Alice. Alice was in contact with Falk, who is investigating the company’s finances because dodgy things are going on. Falk received a voicemail from Alice the night she disappeared, but her phone signal was awful and he only caught two words: “hurt her”. Alice went missing in a serial killer’s old hunting ground. His son is apparently still around. There is a series of flashbacks scattered throughout the book that slowly show what really happened in the outback with the women. We see that Jill put herself in charge, Alice was really bossy, Lauren knew Alice from school, and the twins Beth and Breanna are at odds. On the first night, the men and women mingle and Alice talks with her boss, Mr. Bailey. After this talk, she tells Jill that she wants to return home to her daughter, Margot. The women seem to have gone off track on the second day. The cops hunt for the cabin where the women said they spent the night. This takes a while because the area they have to cover is huge. Lauren leaves the site to return to Melbourne to be with her daughter, Rebecca. We learn that Alice led the women in the wrong direction on the second day. They have to camp outside that night. Carmen and Falk bond a bit. He shows her the maps his father annotated. Carmen and Falk go to Alice’s house, where they find Margot on her own. She’s upset because her ex has shared photos of her with his friends, and they’re making the rounds at school. This ex-boyfriend is Mr. Bailey’s son. Falk drops Margot off with Lauren and Rebecca. Rebecca is also clearly going through some difficulties, which seem to be to do with the school. Falk goes to talk to Mr. Bailey about his son. He and his wife insist that his son didn’t distribute the photos. In the flashbacks, we see the women arguing a lot. They finally come across a cabin. Alice wants to keep heading north to try to find a road, whereas the others want to stay put and wait for help. Finally, the cops find the cabin. There’s blood on the floor, and a dead body buried nearby. It’s not Alice, though. Falk talks to the twins. Beth becomes quite irate, and reveals that she hid Alice’s body to protect Breanna, who fought with Alice the most. She says she found Alice’s body slumped against a rock, so she moved it away from the path. Beth blames Breanna for trying to pin the murder on her (although that’s not what Breanna was doing), as she thinks Breanna is unstable. The cops find Alice’s body. It turns out that Lauren killed her during an argument. Alice was trying to leave with the phone and Lauren wanted to stop her. The two wrestled, and Alice hit her head. Lauren went back into the cabin, telling Alice that she could leave if she wanted to. Falk has to talk Lauren out of jumping from a cliff. He doesn’t manage it, but he dives in after her and saves her life. She’s arrested. Breanna gives Falk and Carmen the files about BaileyTennants that they were after.